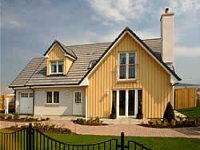 This former show home for the Robertson development, offers luxury living with designer interiors and furnishings ensuring complete comfort and luxury after your daily adventures in the heart of the highlands. Such is the charm of the house you may want to spend some of those days indoors or enjoying the private garden. Lochan Mor benefits from uninterrupted views over the surrounding countryside. Lochan Mor Lodge sleeps eight people comfortably in four large bedrooms, all beautifully furnished.